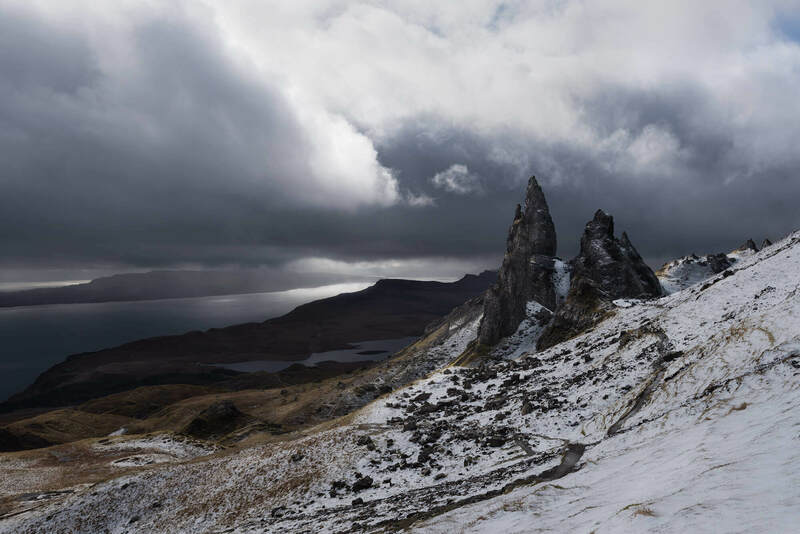 Another shot from the Isle of Skye trip in 2016, the Old Man of Storr is an iconic shot from Skye. There's great parking along side of the A855 main road and as with all the places I parked on Skye its free. There's a good walk up towards the Old Man of Storr and to get to where I took this you keep going past where the 'tourists' seem to stop. Again its worth checking the ephemeris (you will need to adjust the dates to your chosen date) to see where the lights going to be, would have loved to shoot more here as I can imagine a sunrise or good sunset would look amazing. The post process on this one is using bracketed shots at 1 stop increments and then I stack them in photoshop, bump the sky slightly on one of the darker shots using Nik Collection and then totally mask out the lighter layers using solid black on the mask. I usually order the layers darkest at the bottom and lightest at the top and using a Wacom tablet I then paint onto the masked layer with a soft brush and the colour white to reveal sections of that image that I want. Most of the post work on this one was pulling the details out on the rocks.